The new brilliant blue Water Lokai is a way for us each to do more. Did you know? 663 million people live without clean water. Together we’re helping Charity:Water change that. When you purchase the Water Lokai between August 16th, 2016 and September 16th, 2016, Lokai will donate $1 to Charity:Water and 100% of Lokai’s donation will fund clean water projects in Ethiopia. TIME – Charity:Water wells can save individuals in Ethiopia 88 minutes per day. This is time that a person in Ethiopia would have spent collecting water. PROPERTY – Communities with wells have time to grow food, earn an income, and go to school. All of these help combat poverty in their areas. EMPOWERMENT – With this time saved, women can now go back to school, start businesses and improve their homes. HEALTH – Clean water and basic sanitation can save around 16,000 lives every week. “Most of us have never really been thirsty. We’ve never had to leave our houses and walk five miles to fetch water. We simply turn on the tap, and water comes out. Clean. Yet there are 663 million people on the planet who don’t have clean water. Stop in Island Water Sports and buy this limited edition Lokai bracelet! Your purchase of the Water Lokai bracelet will make an impact that effects generations in Ethiopia. Be part of so many others making a difference. Join people like Tony Hawk, who has been part of what Charity:Water does. Several years ago he purchased a well in honor of his daughter Kady. This is just one of the many stories where Charity:Water has made a lasting difference. Kady Hawk’s well in Golebet, Ethiopia. from charity: water (special donors) on Vimeo. Ethiopia is close to our heart. It is estimated that 50 to 60 thousand street kids live in the capital of Addis Ababa alone. These kids are subjected to hunger, violence, trafficking, drugs and more. 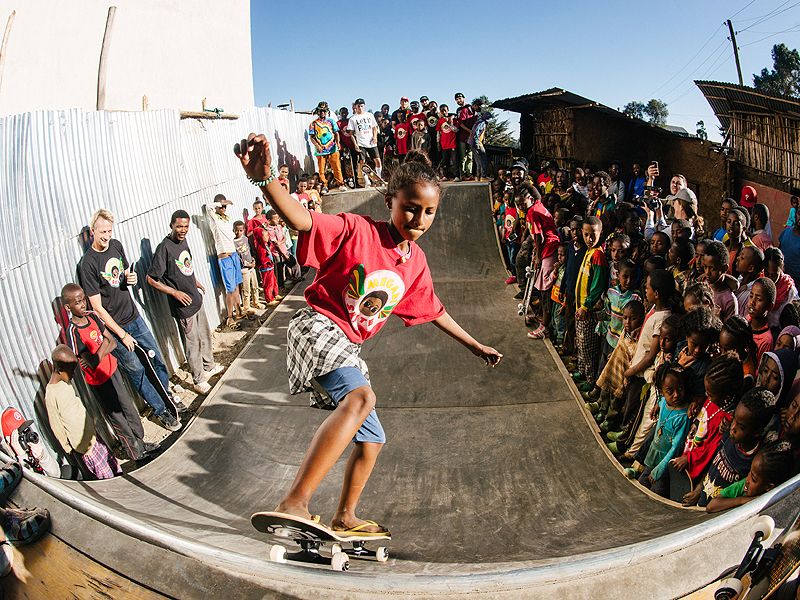 In 2012, IWS family, Uli and Zion had the chance to visit Ethiopia and build one of the first skate ramps in the country. It was a labor of love as materials were scarce and hard to come by. Just finding recycled nails took days. But through this experience they met a good friend and founder of Megabi Skateboarding, Israel Dejene. Israel and his family work with street kids in Addis and instill hope in the future for these kids. Israel fell in love with skateboarding during a trip to Sweden and dreamed of bringing it back to his country. A mutual friend connected Uli and Israel and was able to bring a small team, including infamous skateboarding legend Simon Woodstock to get something started. Jamie Thomas, Elemental Awarness, Academy Skateboards, The Whosoevers and various individuals donated boards, shoes, and clothing for the team to bring with them. They created some makeshift ramps and delivered the boards but continued to DREAM BIG for a more permanent solution. Israel and Uli continued to stay in contact and God began to open doors. In 2015, this dream became a reality. From relationships built over the next few years, a team came together that would bring more than we could ever imagine to the kids at Megabi Skate. Tony Hawk, Nyjah Huston, Aaron “Jaws” Homoki, Matt Berger, Derrick Wilson, and several others jumped on a plane and headed over to Addis to build a permanent concrete mini ramp. They went to Ethiopia on a mission to fix broken wells outside of the city of Addis, bringing fresh water to thousands of residents in the area. However, they also traveled there in support Megabi Skate, Ethiopia’s first skatepark project and Israel’s vision. Uli and Zion were able to touch base with Nyah, Tony and Jaws last year to hear first hand about the experience. All three said it was a life impacting trip and maybe one of the best skate trips they had ever experienced. Watch the ESPN video here. Uli and Zion hope to head back early next year with the “dream team” to build even more. To find out more about Megabi and their project in Addis contact Christian Skaters.